Of all the stocks you should be making at home, fish stock is it. Why? Because it's more delicate and fresher tasting than anything you can buy commercially. As with most stocks, the beauty is that you control the ingredients (and homemade stock is usually cheaper than what you'll find at the supermarket, plus it makes a ton — perfect for freezing.) The only problem with homemade stocks is that they're gone too quickly! Don't forget to check out our primer, How to Make Homemade Stock. Fish bones are nearly impossible to find, but you can buy small whole fish, minus the heads and skins. We chose catfish for its bones and tilapia for its mild flavor, which won’t overpower the taste of your finished food. You also can freeze leftover shrimp or lobster shells and toss them into the mix. 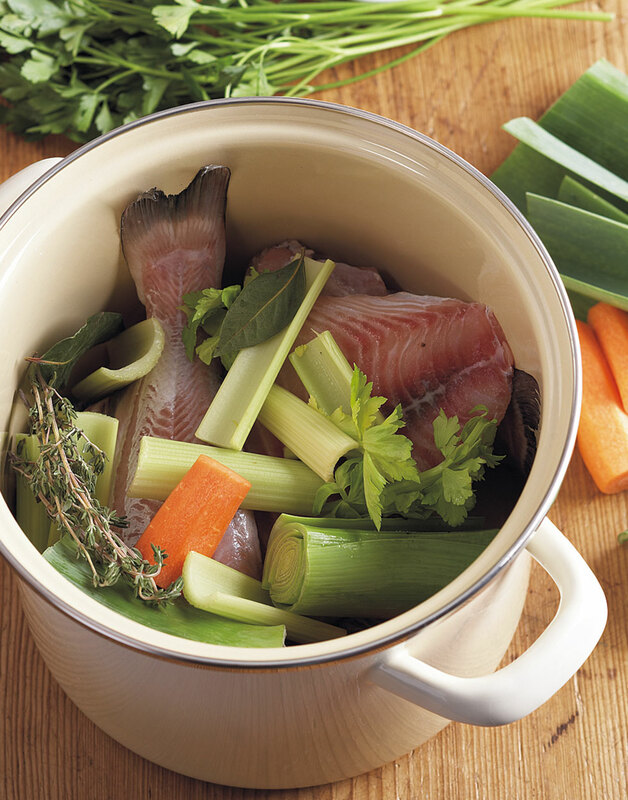 Place fish, carrots, celery, leek, parsley, thyme, bay leaves, and peppercorns in a 6- to 8-qt. stockpot. Add cold water to cover contents of stockpot by 1 inch; Simmer stock over medium heat 45 minutes to 1 hour. Skim off and discard impurities that rise to the surface. Using a fine mesh sieve, strain stock into a large bowl, discarding bones and vegetables. In an ice bath, cool bowl of stock to below 40°. Cover stock with plastic wrap and refrigerate. Before using stock, skim off and discard layer of chilled fat.